I met Shane Mahoney, the world famous, Canadian wildlife biologist, researcher and writer, at the CIC General Assembly meeting in Belgrade ten years ago at the showing of the documentary, Opportunity For All, co-produced by him and the North American Elk Foundation and based on the North American wildlife conservation model. As I watched the documentary, I was immediately struck by the many similarities and even more differences between it and the South African wildlife conservation model and resolved, there and then, to try and produce something similar for my own country. Altogether it has taken me four years to produce the South African Conservation Success Story, which is a little over twice as long as Opportunity For All and, without the unstinting help of many, many organizations and people, not the least of them being my friend and director of photography, Theo Pretorius of Witch & Wizard Productions, I would still be far from finished. 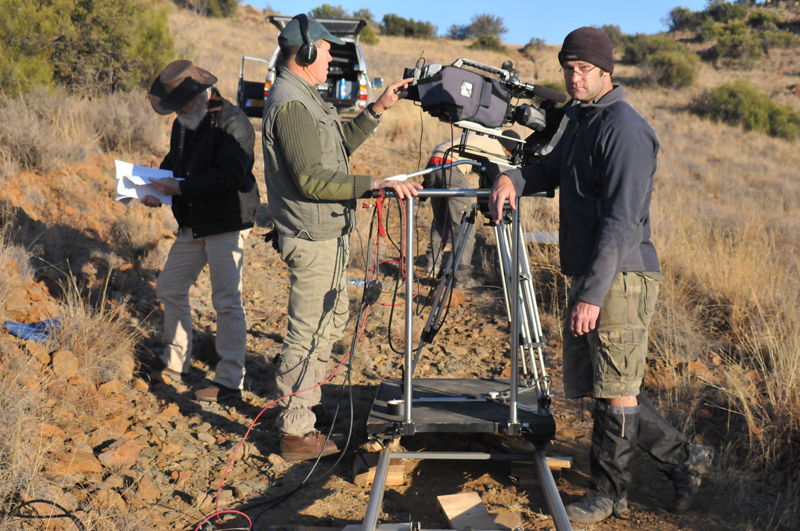 Shane Mahoney, the main narrator, Theo Pretorius, director/DOP and Justin Van Zyl, grip, preparing to film part of the documentary on the slopes of the Rooiberge (Red Mountains) on Bankfontein in the Karoo. 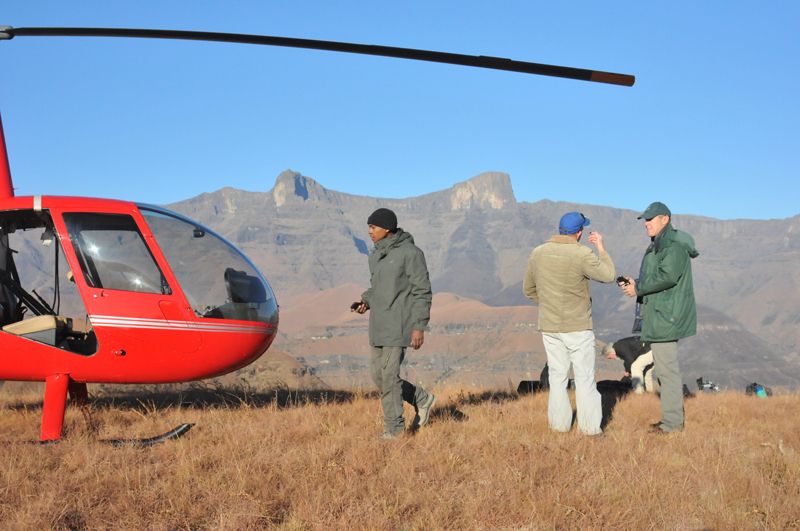 Jermain Beston, production manager, our pilot and Theo in the Drakensberg planning on how to fly our main narrator, Shane Mahoney, up to the top of the mountains in the background for one of the scenes in the documentary. Our Kruger Park game ranger, Shane, Christie Knell, our autocue operator, Justin, Theo and Jermain in a river bed in Kruger National Park about to film one of the scenes in the documentary. We received wonderful assistance and co-operation from all in the park from the CEO to the rangers. 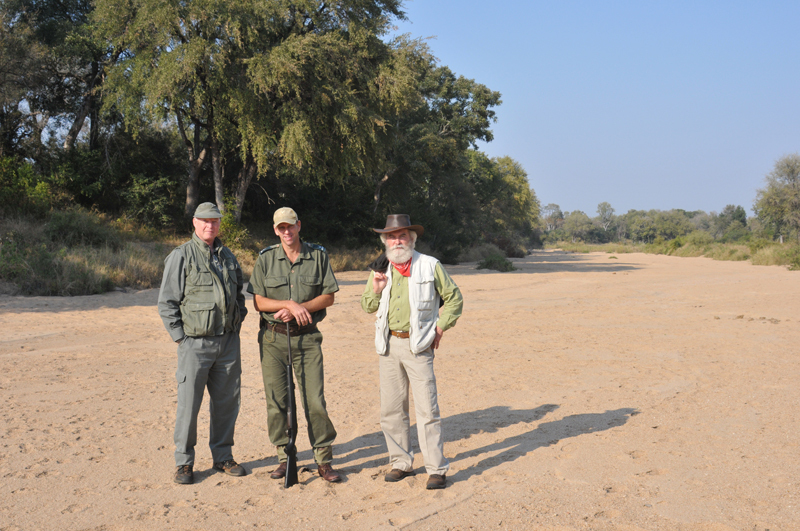 Shane and I together with our Kruger Park game ranger during the filming in a river bed in Kruger National Park. 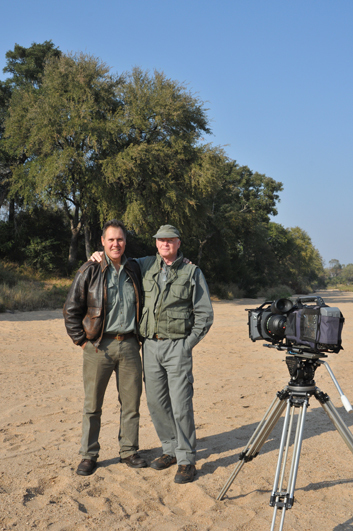 Theo and I in a river bed in Kruger National Park during the filming of the documentary. We are not entirely sure how many films we have made together over the last 24 years but guess it is more than 30 and less than 50. The documentary starts with the arrival in Table Bay of the first Europeans to settle in South Africa in 1652 and traces their effect and the effects of those who came after them, on the natural resources of the country. Quite simply, for the next 300 years, Africa experienced the greatest destruction of wildlife that the continent has ever known. So much so that, when a census of game was conducted in the country in 1964, barely half a million game animals still survived. And then, almost miraculously, over the next 40 years or so, wildlife numbers recovered to nearly 19 million game animals. Why did this happen? How did this happen? And what has happened from the 1990s to the present? These are the questions that the documentary tries to answer by drawing on the facts unearthed by the extensive research conducted for this project. This documentary tries, as far as is humanly possible, to let the facts speak for themselves; to provide the viewer with a factual foundation upon which to base sound decisions on the kind of future he or she would like for wildlife and its conservation in this country, in the hope and belief that, if such wise decisions are made, the people of this country will keep wildlife with them for future generations and this selfsame wildlife will provide opportunities for all in perpetuity. The documentary is aimed at those in government who are currently considering legislation affecting our wildlife and its conservation and those who will take their places in the years ahead – our school children. A copy of the DVD has been given to every Member of Parliament and to every school principal who has agreed to show it to their pupils. In the interests of the greatest possible distribution, we will offer the documentary to broadcasting networks provided they make a contribution to the cost of further distribution of the work. We have also decided to produce a digital copy of the documentary this year, which can be downloaded free of charge, so watch this space. During 2016, the text of the documentary was recorded on a flash drive by HAWASA, the Hunting and Wildlife Associations of South Africa and given to thousands of attendees at the CITES COP in Johannesburg. In addition, the South African Hunters and Game Conservation Association of South Africa has taken delivery of a thousand copies with a view to further distributing them to schools in the country. Since producing The South African Conservation Success Story, time has not been kind to conservation in Africa, in general, and South Africa, in particular, if you believe – as the facts have demonstrated – that hunting is the corner stone on which conservation has been built. Hunting is under attack from government organised poaching, commercial bushmeat killing, from canned killers and those domesticating wildlife and breeding unnatural colour variants, as well as the predominantly foreign, urban, academic led animal rightists and anti-hunters, despite the fact that the latter have nowhere demonstrated any positive practical effects of their propaganda and policies for conservation of wildlife and wildlife habitats in Africa. When James Mellon produced African Hunter in 1975, you could hunt in over 30 African countries. Today the number is 13 and, in countries like Ghana, Liberia, Chad and CAR, there are only one or two outfitters. In an attempt to counter some of these attacks, I have worked with the President of the South African Hunting and Conservation Association – with over 40 000 members, the biggest association of its kind in the southern hemisphere – to form The Fair Chase Guild under the auspices of this association, which will have as its main aim, the development of a three year public relations strategy to be implemented by a top rate, professional PR company, to promote the benefits of unashamedly ethical hunting. The Guild will be launched by SA Hunters later this year.